On the threshold of the year 2008, we greet you with pontifical blessing and warm Christian love from the center of the Armenian Catholicosate of the Great House of Cilicia in Antelias, wishing you a plentiful year full of divine blessings. As you know, every year, through a pontifical message, we appeal to our people to individually and collec­tively reflect and focus their attention on fundamental issues and priority concerns pertaining to our life, in general. In this regard, we had drawn your special attention to the central place and vital role of the Bible (2003), the Family (2004) and the Armenian School (2006) in the life of our church and nation. Indeed, in speaking about these sacred values and structures, we had emphasized the pivotal importance of Christian education in the spiritual and intellectual formation and enrichment of the Armenian people and, generally speaking, the strengthening of their Christian faith. Let us first attempt to briefly understand the meaning of Christian education, its purpose and im­portance. Then, in light of the realities surrounding us, let us identify the most effective means of providing sound religious education to our people. What do we understand by Christian education? Taking a general approach, religious education means instilling individuals or communities with the truths and principles, values and traditions of the religion to which they adhere. All these must be integrated into the modus vivendi, modus operandi and thinking of those individuals or communities. In other words, the purpose of religious education is to make religion, with its beliefs and teachings, its history and mission, a total, permanent and living presence in the life of an individual or community following it, through a process of spiritual and intellectual development and formation. a) Molding the individual, who is called upon to become, or has already become, a member of the church of Christ, with biblical truths and values, so that s/he can follow Christ with conscious faith and total devotion. b) Along with biblical teachings and moral principles, the purpose of religious education is to transmit to the Christian individual or community the history of the Christian religion, in general, and the tenets and theological approaches of the church s/he belongs to, as well as basic information about the lives and works of the fathers, saints and martyrs of that church. d) Being a true Christian requires a total identification with one’s essence and existence, because it means consciously following Christ (Matthew 16:24) and putting on Christ, as characterized by the Apostle Paul (Romans 13:14). Therefore, Christian education is not just a transmission of knowledge; rather, it is the spiritual and intellectual making of an individual or a community, having Christ as “the way, the truth, and the life” (John 14: 6). This is why Christian education must be realized essentially as participation in the mission of faith of the mystical body of Christ, the church. Based on its purpose and considering its singular importance, Christian education has been consid­ered the heart of the church’s mission by all churches, starting in the early centuries. Evangelism, preaching, social service and other initiatives connected with the church’s mission are, undoubtedly, mandatory for the spread of the Christian faith. However, among all these, the spiritual and moral formation of the Christian man or woman is an absolute necessity, as a precondition for the spiritual building of the church. The church, as a community of faith, is comprised of individuals. The church becomes strong and viable in the spiritual and moral sense, when its members have been molded through wholesome religion. Indeed, the human being has value insofar as the Christian religion is concerned. During his earthly mission, Christ approached the sick and the poor, the rich and the deprived, because he had come to rehumanize man according to his “divine image.” Thus, the process of consciously transforming the individual human being into a Christian, through the total assimilation of the truths of his/her faith and the principles of spiritual and moral life, has been and remains the primary concern of the church. These days, religious education has assumed a more pronounced importance for churches. Indeed, the seri­ous dangers brought about by globalization have begun to threaten the basic beliefs constituting the essence and foun­dation of Christianity. The man-centered standards and man-serving approaches of the world have begun to call in question the principles of the spiritual kingdom established by Christ. In today’s world, when the spiritual kingdom of Christ and the material kingdom of man are in constant conflict, it is the urgent obligation of the church to arm Chris­tians with the eternal truths and values of the Gospel. Driven by this awareness and inspired by zeal, all churches are devoting a great deal of manpower and expending huge sums for religious education, to protect their faithful against the dangers driving God’s presence out of human life, on the one hand, and imbuing the young generations with Chris­tian values and principles, on the other hand. Starting from the early centuries, the Armenian Church has paid special attention to education. In­deed, beginning with the discourses of St. Gregory the Illuminator and continuing with the spiritual and intellectual work of the Holy Translators, and then the spiritual literature created by our church fathers during the Silver Age; beginning with the spiritual, moral and social teachings and canons of the Armenian Church and ending with its exten­sive humanitarian, evangelical and educational activity in Armenia, Cilicia and the Diaspora, there is eloquent proof of the deep concern and care tangibly displayed by our church with regard to the spiritual and moral education of the Armenian people. Christian education remains and must remain a priority within the scope of the Armenian Church’s mission of faith. In this regard, we consider it important to underscore certain basic points, which constitute the special nature of the Christian education being carried out within the life of the Armenian Church. a) Christian education must not be understood from a self-centered and self-serving viewpoint; it is neces­sary to view it within the context of the interrelationship between the Armenians, as a whole, and Christianity, and in light of a wealth of historical experience. It is a known fact that the conversion of the Armenian people to Christianity was not an ordinary event. The Christian faith penetrated Armenian life, became an integral part of Armenian life, and became identified with the internal texture, crises and aspirations thereof. This total and inseparable union of the Armenian people and Christianity must be distinctly expressed in Christian education. Indeed, lines of separation be­tween Christian education and Armenian education cannot exist; these two components must complement, strengthen and enrich each other. b) For us, being Armenian means being Christian. Christianity constitutes the basis and the esse of the formative process of being human and being Armenian. 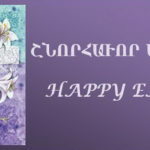 Armenian education must be accomplished with a total and conscious grasp of the unique spirit and faith, thinking and life, style and quality of the Christian religion. Therefore, Christian education is called upon to give direction to Armenian education. 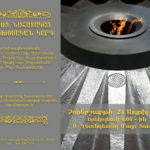 Christian values and truths must radiate like sunlight in the life of the true Armenian. c) For our church, religious education has not been and must not ever become solely teaching of the Bible. The Bible is the center of the Christian mission, teachings, rituals and, generally speaking, the Christian life. The spiritual and moral principles of the Bible are considered the cornerstone of Christian education for all times and all Christian peoples. However, the Bible finds its precise, true and full meaning and value in the common life of the church. Thus, it is necessary to combine biblical history and interpretation with the centuries-old spiritual and intel­lectual creative output of our church, its witness of faith, the lives and works of our church fathers, our saints and martyrs, who have toiled and created, and who have shed their blood, for the realization and spread of the Christian faith. In other words, it is necessary to approach Christian education from a comprehensive perspective. How is Christian education to be accomplished? a) Christian education constitutes the basis of the church’s mission and, therefore, the church is ultimately responsible for it. Any activity related to Christian education must take place under the auspices of the church. Any attempt at teaching the Christian faith outside of the church, beyond the boundaries of the church’s jurisdiction, is not acceptable. Sometimes, such initiatives, which are carried out by individuals with self-centered approaches and in enticing ways, can lead the faithful and especially the youth in the wrong direction. It is necessary to be wary of such phenomena. b) With human being’s spiritual and intellectual formation being the purpose of Christian education, it is necessary that present-day concerns and challenges facing humankind not be taken lightly. Christ did the same thing. The events and issues of his time were a dominant presence in the examples he gave and the parables he told. We cannot ignore the present world. Christianity is not a self-centered reality apart from society. The Son of God came into this world to revolutionize and renew life. Christian education must be accomplished with the same approach, in order to prepare the kind of Christians who, being fully cognizant of the evils and crises of the present-day world, can become committed to changing the order of human-centered values prevailing in today’s society, in accordance with the truths and imperatives of the Christian faith. c) Christian education must be accomplished according to the traditions of the Armenian Church and the internal specificities of our community life. It is necessary for our culture and language, the rites and structure of our church, our national perceptions and convictions to have their place in the efforts connected with Christian education. In addition to all these elements, we cannot ignore our immediate environment. Fences and boundaries, in effect, no longer exist around us. This situation impels us, on the one hand, to steadfastly cling to our perceptions, traditions and experiences, while, on the other hand, to cautiously become responsive and receptive to our environment, adopting, when necessary, ways and means, which don’t jeopardize the identity of the Armenian Church and the particularity of the Christian education being implemented by it. Naturally, this is not an easy modus operandi; however, it is neces­sary to display a flexible and balanced approach, particularly in the Western countries, in view of the challenges of the modern world. d) Christian education has the indispensable need for the kind of means that will make the communication of Christian values interesting, smooth and effective. It is impossible to ignore the pivotal role of human beings in this process. A mission is accomplished by people who have faith, commitment and vision. A noble task like reli­gious education, in particular, must be accomplished by those individuals, who become living examples of the truths they preach, through their life and work. Along with the educator, each era has its own means of educating, and the church has succeeded in widely utilizing the possibilities afforded by its period and environment. In the present world of globalization, the full and proper use of audiovisual aids will surely make the work of Christian education quite productive. Indeed, the use of modern technology has already become natural and imperative not only for the young generation but also all the members of our church, regardless of age. e) Christian education is a continuous process, which must be carried out in a planned and consistent man­ner through incremental phases. The family and the school have an important role to play in this process, along with the church. Armenian infants open their eyes to the world as part of Armenian families, in which their spiritual growth accompanies their physical growth. Therefore, the parents’ role in Christian education is very critical. That is why the family is considered a “small church.” The Armenian school too must consider Christian education an indivisible and integral part of its civic and Armenian education. Christian education must not be given in our educational institu­tions solely through the teaching of religion but by means of special courses on moral education, and by sharing the Christian views about ethical issues facing contemporary societies. All in all, we consider it imperative for there to be close cooperation between church, family and school. The Catholicosate of the Great House of Cilicia considers Christian education one of the most es­sential aspects of its mission. Based on this commitment, our Holy See has, in recent years, not only allocated the nec­essary human resources as well as ample financial and practical resources to this most important work, but also widely expanded and given new impetus to the efforts involved with Christian education through publications, lectures, sym­posiums and other activities. Let us not forget that the foundation of Sunday schools was laid by the Catholicosate of the Great House of Cilicia in 1930 and, owing to the persistent effort of our previous pontiffs, an extensive network of Sunday schools was created in various communities of the Diaspora. 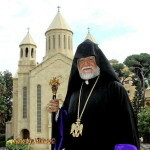 We wish to assert with deep satisfaction that special departments of Christian education were established within the overall structures of our prelacies in all the dioceses of the Catholicosate of the Great House of Cilicia, and they are actively engaged in their work, taking into consideration the ever-growing need of our people for spiritual nourishment. a) More serious importance must be given to Christian education within our families. We emphasized the central role reserved for the family in this regard. However, how is it possible to ensure the wholesome spiritual and moral formation of the infant, when our religious values, spiritual experiences and church traditions have begun to cease being part of our family life; when mixed marriages and divorces have begun to make their presence palpable within Armenian families? The Armenian parent is the first and ever-present educator when it comes to the child’s formation as a Christian Armenian. Therefore, the education of the Armenian child as a Christian necessarily presup­poses the Christian education of the Armenian family too. b) We made a point of stressing that the foundation of a real Armenian education is Christian education. Therefore, it is essential that Christian education be approached with this deep conviction by our schools, where the teaching of religion must become mandatory. We consider extremely imperative the teaching of our church history, along with biblical events and figures, as well as the transmittal of our moral values, to Armenian pupils. When it comes to this point, our diocesan prelates and assemblies must set high standards. c) While we greatly appreciate the ardent activity being carried out by our dioceses in the field of Chris­tian education, we are waiting for it to become more planned and more effective within the life of our people. Bible studies and lectures on spiritual topics naturally have an important role to play. At the same time, it is necessary to take practical steps, whereby it will be possible to make our religious values and traditions a living presence in the life of our people, and to involve the younger generations in particular, in the life and witness of our church by meeting their spiritual needs, and finding answers to their questions and expectations. d) Occupying a special place in Christian education is the liturgy of our church, which inevitably is in need of reform, in order to ensure wider participation by our people. In this realm, we consider preaching important, in particular. The purpose of the sermon must not only be the interpretation of the Bible but also the transmittal of Christ’s message to the people, in light of present-day concerns, imperatives and challenges. A sermon given from this approach and a soul-stirring service will not only spiritually inspire our faithful but also greatly contribute to their spiritual growth and education. e) The present network of Sunday schools inevitably needs to be revitalized. In this realm, we notice a decrease in the number of pupils and a lack of overall interest. The role of the Sunday school is indispensable, as a supplement to the religious education provided by the family and the school. It is our expectation that our dioceses will undertake the reorganization of the Sunday schools operating alongside their churches and schools. We warmly and paternally recommend that our parents take their children, and the schools take their pupils, to Sunday school. The Christian formation of the Armenian is just as necessary as his or her Armenian formation, the building of the Armenian nation, and the construction of the homeland. Indeed, if we survived the rust and dust by maintaining our national identity and unity, then the Christian values and truths professed and lived by us played a crucial role. We profoundly believe that the Christian spiritual and moral values, the eternal truths, which were revealed to the world out of Bethlehem, made their entrance into Armenian life through the apostles St. Thaddeus and St. Bartholomew, and were preached, maintained and defended by our church fathers, martyrs and saints, are the ones that will again keep us sound and strong in the face of the de-Christianizing and de-Armenianizing trends of today’s world. The Armenian Church is pursuing this preeminently sacred goal by means of Christian education. It is with this deep consciousness and zeal that our diocesan prelates and assemblies, our families and school administrators, as well as the structures functioning within the life of our communities, must approach Christian education. 1) By reorganizing Christian education in all its facets and realms. 2) By placing importance on the teaching of religion and ethics in the schools. 3) By allocating the necessary human and material resources to the programs connected with Christian education. 4) By making our people conversant with the viewpoints of the Armenian Church concerning religious, social and moral issues affecting present-day society, by means of lectures, programs and publications geared for both the general public and the youth. 5) By recommending to the clergy to provide spiritual nourishment to our families, senior citizens, and those who are hospitalized and imprisoned, by means of frequent pastoral visits. It is our deep conviction that Christian education accomplished with profound faith and dedication will great­ly contribute to the strengthening of the Christian faith of our beloved people, their spiritual growth and formation. We pray to God Almighty, to strengthen our diocesan prelates, our clergy and teachers involved in the mis­sion of Christian education, as well as our diocesan authorities, our benefactors and structures contributing to the ac­complishment of this sacred goal, with his heavenly blessings.